At BLACK PEPPER we carry three brands Black Pepper, Yvonne Black and Equus. Our styles target mostly the 40 + age group, Yvonne Black being the younger styles, Equus more middle of the road and Black Pepper aiming for the older group. 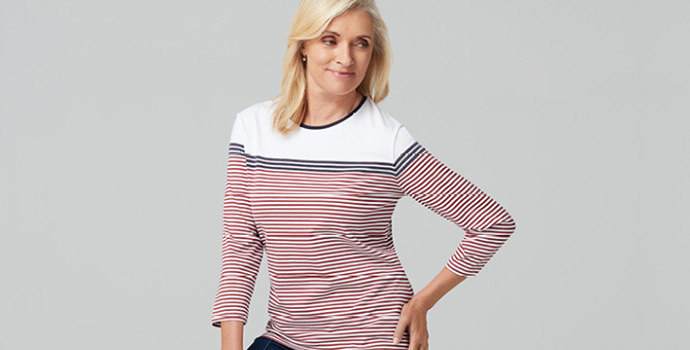 Our styles are mainly casual leisurewear (ideal for travel and sports such as golf and croquet) to casual dress. Most of our styles are mix and match, as well as easy to care for. Most of our basic Ts have 20+ UV Ultraviolet Protection. We welcome new members to our VIP Club. As a member you will have access to special member only deals including your celebration birthday and anniversary reward voucher (conditions apply).